Trumpets & horns - Site de soundsofangkor ! In the Khmer iconography, trumpets or horns have various shapes and sizes. As the conchs, their elementary functional organization is the pair, which could be duplicated at will as it is the case in contemporary India. One finds also horns and conchs parity in the Tibetan Buddhist orchestras. In the majority of cases, the quality of the sculpture doesn't allow a precise organological identification or a formal determination of the material. 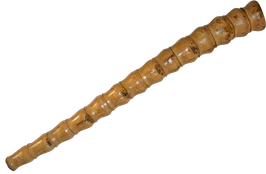 This is perhaps due to the structural simplicity of some of them: simple horn of cow or buffalo whose tip has been cut and pierced. The most beautiful trumpets representation are visible on the bas-relief of the Historical Parade in Angkor Wat. They seem to be metallic instruments according to their length, curve and the particular shape of their bell. 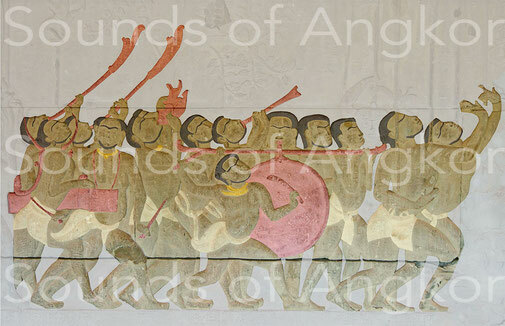 In this scene of the Historical Parade, one sees two long and two short trumpets, one in profile and the other in front. The latter can only be distinguished from its mouthpiece and the upper end of the tube just behind the attachment point of the big drum. These long and short trumpets have a length ratio of one to two, which suggests that they sound theoretically at the octave. If we take 1.65 m as the mean size of characters, the total size of the large horns would be close to 1.30 m and 0.65 m for the short one. The long trumpet at the extreme left and the small one view in profile show a conical mouthpiece. For the long trumpets, the first section of the tube is straight and the bell is curved, shaped like a stylized makara mouth. On the tube extending from the mouth to the base of the bell, there are no connections, which is however the case on most large Asian trumpets, which can be disassembled or telescoped. This connection may be concealed by the left hand of the musicians. On the small trumpet seen in profile appear two series of striations, one above the musician's hands, a second one at the base of the bell's flare. 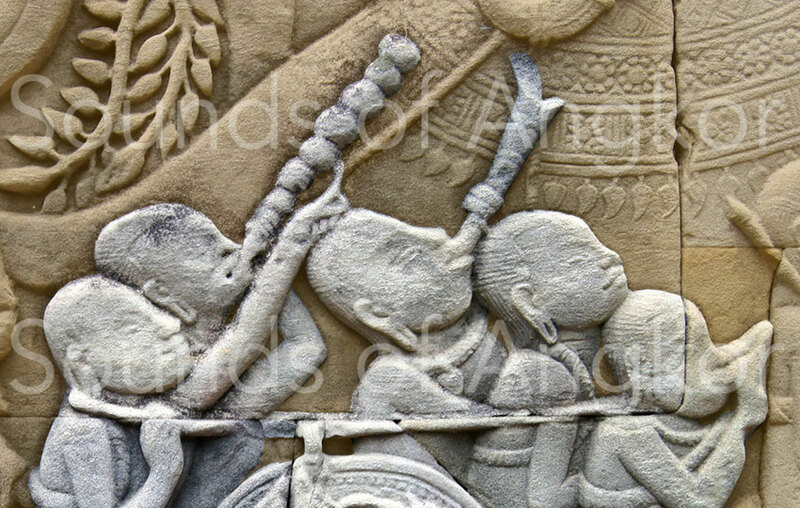 Historical Parade bas-relief. 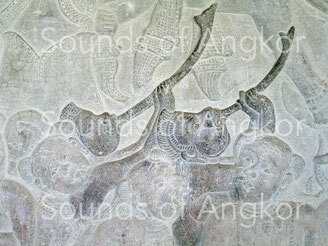 Angkor Wat, south gallery. Long trumpets' reconstitution. Hammered copper, rings and decorative borders in brass. © Patrick Kersalé. Short trumpets' reconstitution. Hammered copper, rings and decorative borders in brass. © Patrick Kersalé. 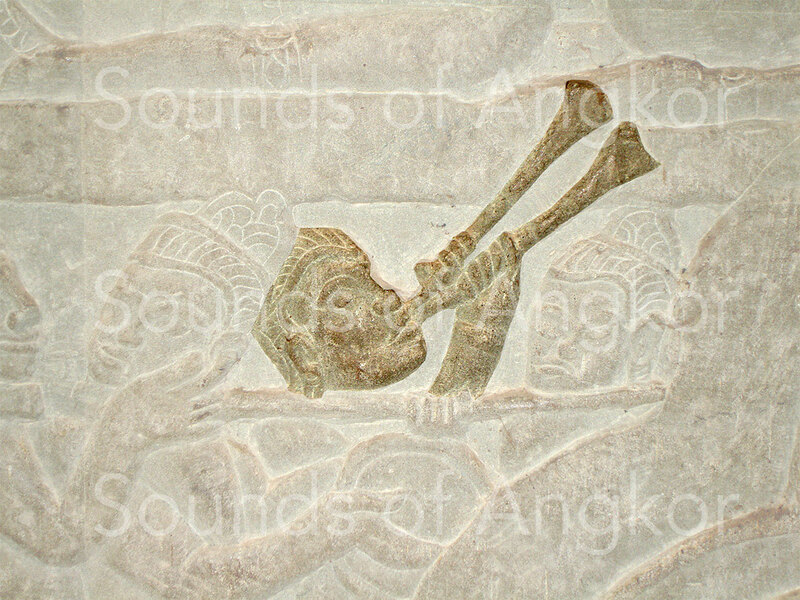 The other trumpets of the south gallery of Angkor Wat are less interesting. They are slightly curved with a small makara's mouth-shaped bell. It is difficult to say if they are trumpets or horns and to define the material. 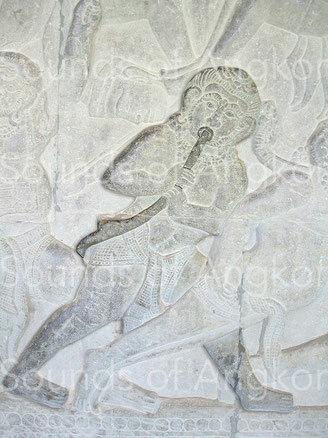 Angkor Wat, south gallery, Battle of Kurukshetra. 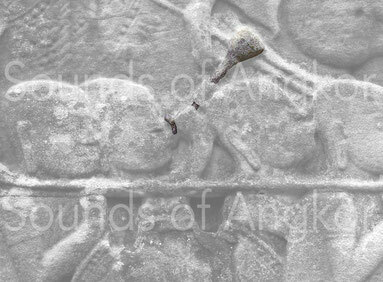 In Bayon, most of the trumpets representations are of poor quality. The mouthpieces are invisible. 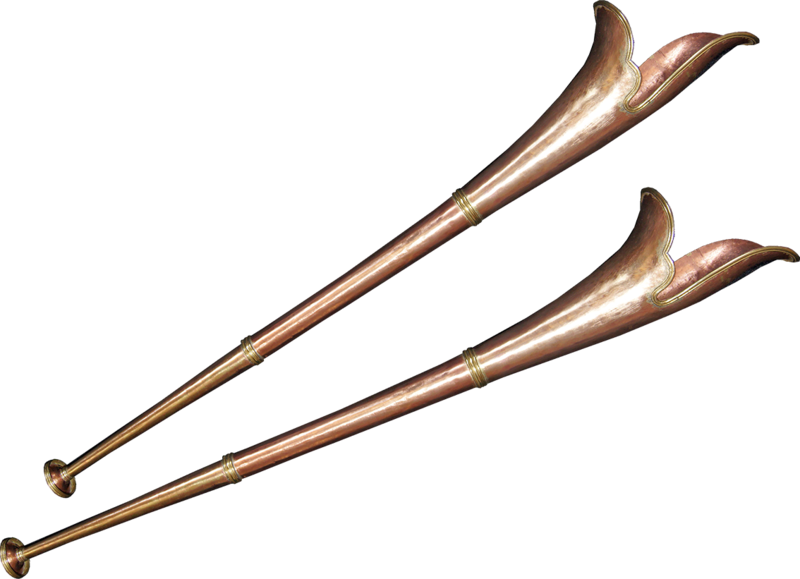 Pair of trumpets or horns played by Cham soldiers. Bayon. A bas-relief of the Bayon shows an atypical trumpet compared to the overall corpus. One can see the mouthpiece and a conical-shaped bell. Atypical trumpet with a conical-shaped bell. Bayon. Even more unusual is a trumpet with an enigmatic shape. It is made of a juxtaposition of spheres of increasing size not corresponding to any known design. 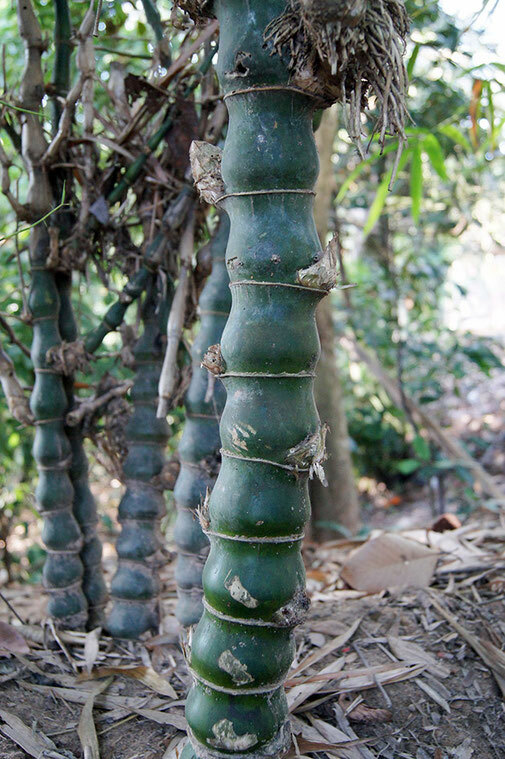 It could be made of bamboo ans especially with the species Bambusa vulgaris Wamin. The irony of history, it is while visiting the tomb of Jean Commaille, a few steps from the Bayon, whose access is bordered by this kind of bamboo, that sprang the solution of this discovery! Reconstitution © by Patrick kersalé. The 16th century trumpets in the north gallery of Angkor Wat are similar to those of the south one (12th century). Some of these instruments seem metallic. 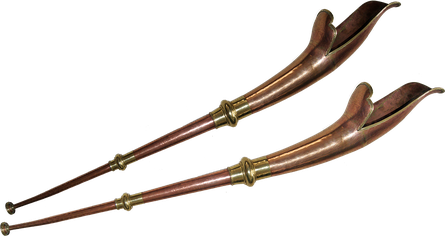 Pair of curved trumpets. 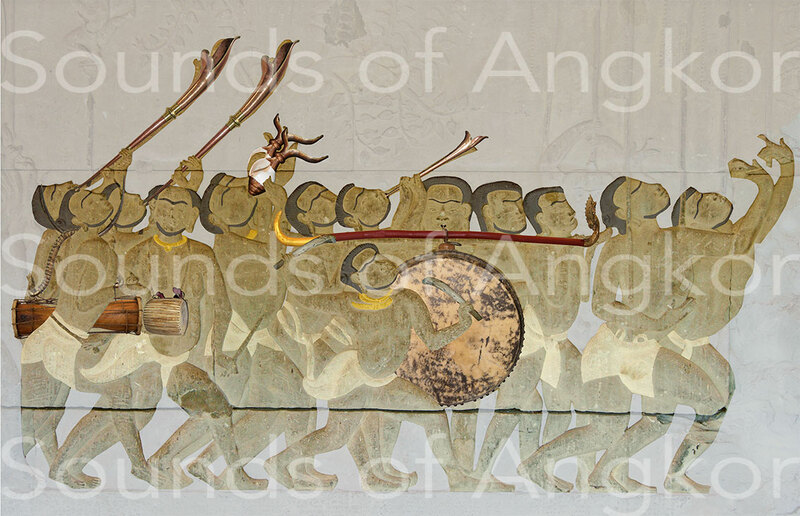 Angkor Wat, Battle of Devas and Asuras, north gallery, west part. 12th century. Curved trumpet. Notice the circular mouthpiece. Angkor Wat, Battle of Devas and Asuras, north gallery, west part. 12th century. 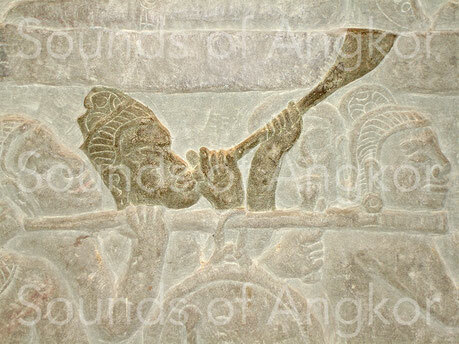 Dual trumpets played alongside single-pipe instruments are also found in the north gallery of Angkor Wat. Are they two independent tubes blown simultaneously or joined together in a single mouth? Flared bell trumpet. Angkor Wat. Krishna’s Victory over Asura Bāna, north gallery, eastern part. 16th c.
Dual trumpet. Angkor Wat. 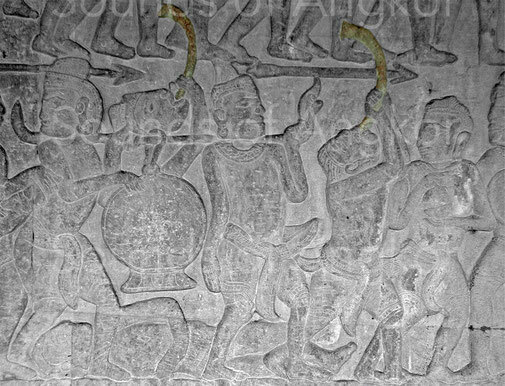 Krishna’s Victory over Asura Bāna, north gallery, eastern part. 16th c.
The iconography of the north gallery of Angkor Wat also reveals some rare C-shaped horns of poor quality in their design, perhaps made of buffalo horn or metal. In India and Nepal exist until now C-shaped metal trumpets. C-shaped trumpet. Angkor Wat. 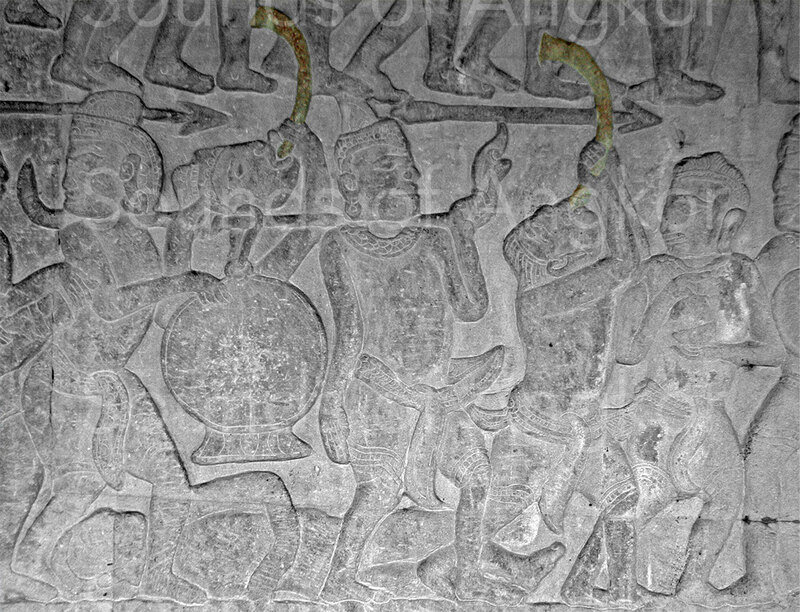 Krishna’s Victory over Asura Bāna, north gallery, eastern part. 16th c.
Pair of narsingha trumpets of Damai people. 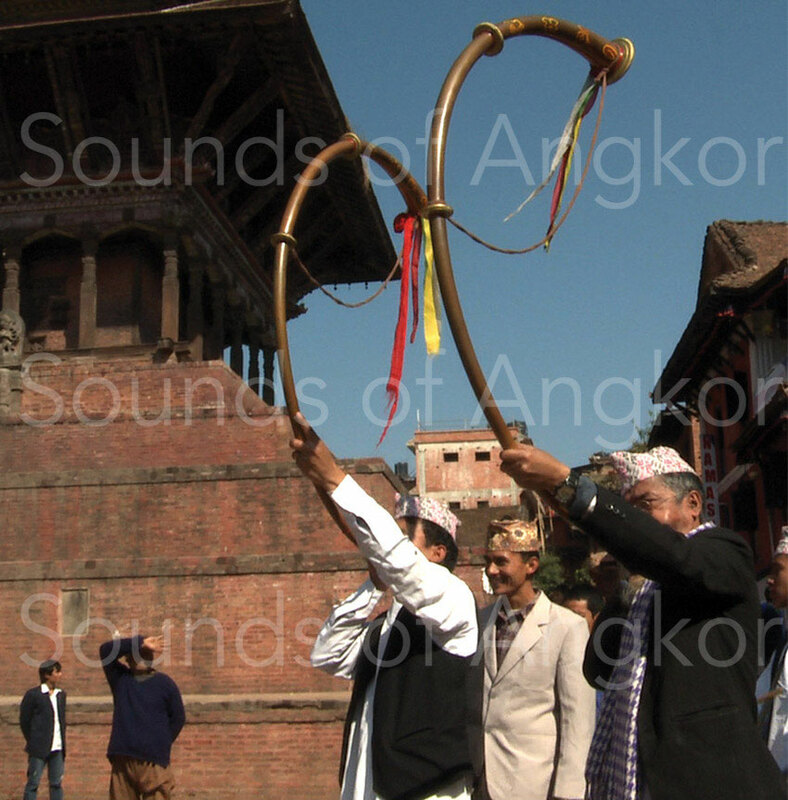 Considered as auspicious, they are played here in a wedding procession across the city of Bhaktapur in Nepal. 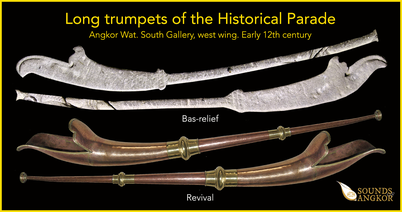 The only term that designate the trumpets is tūrya, both in Sanskrit and Old Khmer. This word was translated by the epigraphists as a "set of musical instruments" in the orchestral sense. 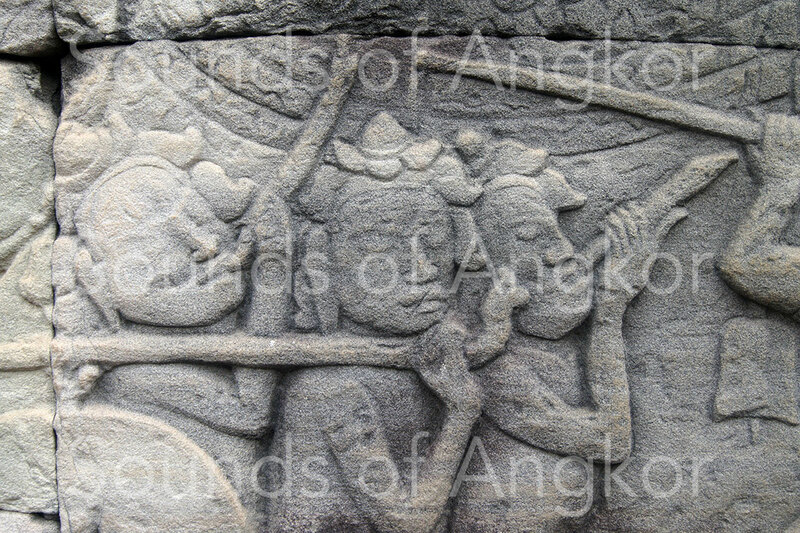 This is particularly the case in G. Cœdès* for the foundation stele of Pre Rup (961 AD). *Cœdès G. 1937 - IC I, p.103:CCLXXXIV. Que dans lʼavenir le culte des dieux, fixé ici par lui, pourvu dʼor, plein dʼune quantité de joyaux, ayant pour bruit des vagues le son des instruments de musique, soit comme lʼocéan augmenté par le temps [ou : le flot]. Que dans lʼavenir le culte des dieux, fixé ici par lui, pourvu dʼor, plein dʼune quantité de joyaux, ayant pour bruit des vagues le son des trompes, soit comme lʼocéan augmenté par le temps [ou : le flot]. That in the future the worship of the gods, fixed here by him, provided with gold, full of a number of jewels, having for sound of waves the sound of trumpets, or as the ocean increased by time (or: the flood). The founding inscriptions of the Lolei temple (late 9th century) offer eight lists in which there are male players of tūrya (written turyya), five out of seven occurrences and four out of the eighth one. The inscription of Prasat Kravan temple (921 A.D.) quotes three players of tūrrya. What is striking in all these examples is the assimilation of the instrument name to that of the musicians. Indeed, for percussion and string instruments there is a specific terminology that describes the musician as "percussion instrument player" and "string instrument player" respectively. Now in the case of tūrya, instrument and musician become confused.